I remember when people thought Wizards of the Coast was literally insane for printing a card as efficient as Watchwolf. Over time, we’ve sort of gotten used to the card and to the average power level of creatures being higher, but it’s still a card you’re never unhappy to see – it applies a ridiculous amount of pressure on the second turn and stays quite relevant late into the game. Theros’ Fleecemane Lion has the additional abilities that make it a popular choice in competitive formats and/or midrange decks, but it’s often overkill and also not relevant to the Zoo archetype. If you want my advice, it’s to go with the original, for balance and for style! Green excels big creatures while white specializes in lots of weenies. The philosophy behind Watchwolf’s design was to find a balance and create an oxymoron, the “big weenie.” 3/3 is fantastic early game stats and pretty decent for mid game as well. In Limited it is a bit inconsistent to get both the lands you need in your opening hand. That being said, Master of the wild Hunt is in the same set so there is potential for a wolf deck. In Modern this pup is outclassed by Fleecemane Lion, but dogs are better than cats so that’s a bonus. Watchwolf also has a hard time fitting into Wolf tribal due to the White in its cost. Watchwolf is a good card, yet I have a hard time recommending it outside of a Muraganda Petroglyphs deck. 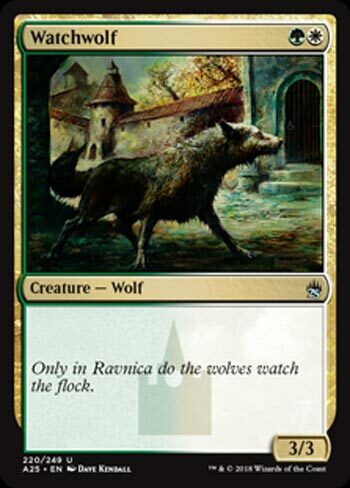 Eons ago, Watchwolf was a revolutionary uncommon, a 2-mana vanilla 3/3. Vanilla 2-drops had never been this big before, and Watchwolf perfectly exemplified what you could get out of going two colors that one color could not provide. It’s a very efficient card in a deck that can support it and get it out on turn two…which Ravnica definitely offered, with the shock lands making their debut here and allowing for more flexibility. Watchwolf today is almost strictly worse than Fleecemane Lion from Theros, barring interactions with cards like Muraganda Petroglyphs. But it’s still powerful all the same, and it may have a home in Wolf decks or in other decks that strive to be low to the ground, so to speak.